... when I gave my short speech on the importance of the depot that was no longer noticed, a structure that had housed the Potlatch Lumber Company offices which established the Weyerhaeuser/Laird/Norton group of Midwest lumberman’s move into the northwest, which led to the development of Boise Payette (Boise Cascade) and Weyerhaeuser, two companies, along with Potlatch, that became the lifeblood of the Pacific Northwest, both Earl Holding and Wally Huffman, [37 year] owner and [32 year] manager, respectively, of the Sun Valley Resort, nodded in agreement. I found their attention to my words very encouraging. When the depot project slide show was introduced before I spoke, Ron Gardner, the emcee, put in a plug for us about needing money to complete the depot’s interior, and I reiterated our willingness to accept donations, large or small. I concluded with a request that all the luncheon participants open their eyes a bit more when they returned home after the conference, to look at their familiar surroundings with a more objective eye, for they, too, might have an unpolished gem awaiting notice in their own home town. One humorous side note. I didn’t realize the award was a secret, so I let the cat out of the bag when I was introduced to our northern region representatives. When I told them why I was there, they gave a startled “whoop!”, then covered their mouths, since they had no idea our region was receiving an award! To their credit, and my relief, they pretended to be surprised when the time came for the “official” announcement. The presentation was very nice, emotionally uplifting and rewarding. We are seldom acknowledged for preservation work, so I found myself a bit emotional when speaking. The luncheon was fantastic. It was our first time to Sun Valley, and Becca and I enjoyed being there, if only for a few hours. The Potlatch depot received the Take Pride in Idaho “Outstanding Historic Preservation Project” Award at the annual Idaho Conference on Recreation and Tourism last week in Sun Valley. Past HPG president Jim West was on hand to collect the honor. The statewide recognition was first proposed by Angela Osborne of the University Inn in Moscow. The winner was then selected by a panel of judges from the Governor’s office, National Arts Commission, Idaho Historical Society and Preservation Idaho. In today's posting, we see Holly Colvin's ideas for the depot upstairs. Holly, like Karen, envisions quality office space upstairs, with a conference room and break room as part of the mix. As an architect, Karen Owsley has focused on historic preservation, so she's retained the transoms and woodwork. Holly, as an interior design student, has done the same. The HPG has long felt that some of the historic features of the depot need to be preserved at all costs. Yet at the same time, most depot supporters want the building to feature more efficient heating and lighting. Note Holly's color schemes for the office space. She also has found some attractive light fixtures for use in the building. As in past postings, we encourage blog readers to comment on their own ideas for the depot. 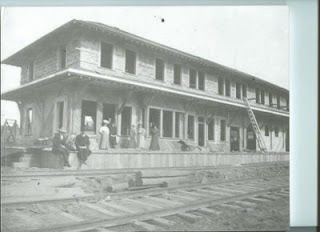 Although most of the depot interior ideas have imagined the freight room as the new interpretive center, Holly Colvin designed the interpretive center in the waiting rooms at the north end of the building. It presents a completely different set of possibilities. Holly's designs were presented last week at UI and were done as part of a class taught by Shawna Corey. We are pleased to have such quality student input. Thanks Holly! Last week UI interior design student Holly Colvin presented her ideas for the depot interiors. The blog will show some of her work over the next few days in hopes that depot supporters will do their own thinking about possibilities for the interiors. In this post, Holly envisions the freight room as a coffee shop/internet cafe/used bookstore. The HPG has been fortunate to work with students from Dr. Wendy McClure's classes in the past and we thank Shawna Corey for keeping her UI classes involved. Holly's presentation shows that there is indeed community interest in this historic building! At present, we continue to work with architect Karen Owsley from Moscow. Karen has been a long-time leader in historic preservation in Latah County and has served on the Latah County Historic Preservation Commission. In the future, we will be posting some of Karen's ideas as we go forward into the next phase of restoration of the historic WI&M depot at Potlatch. University of Idaho interior design student Holly Colvin thought the depot would be a great project for a class assignment. Her goal was to come up with strategies for the depot interiors, keeping in mind the community's needs and its heritage. Holly presented her designs and concepts May 6, with HPG members Don Somers, Jack Coyner and Barb Coyner in attendance. Libby Coyner, originator of this blog, also attended Holly's presentation. Because the HPG has already been working with architect Karen Owsley on interiors, Holly's ideas presented a contrast. For starters, she moved the interpretive center into the waiting rooms, and used the depot office space as a headquarters office, gift shop and book store for the HPG. The freight room, in Holly's estimation, would make a wonderful coffee shop, complete with a used book store and an internet cafe. Upstairs, Holly stuck with the idea of office suites, a conference room and multiple-use space. In an upcoming posting, we will show some of Holly's concepts, pictures and plans. She and other students from Professor Shawna Corey's class will have their presentations on display at the Prichard Gallery in downtown Moscow within the next two weeks. Stop by and take a look.